The next wave of Marvel NOW! titles is more like an avalanche, as long serving staple characters get another shot at a new series. This includes an all-new Ghost Rider who prefers muscle cars, and former War Machine, James Rhodes, becoming his own man as Iron Patriot. Firstly, a little confusion seems to have reigned over The Fantastic Four. 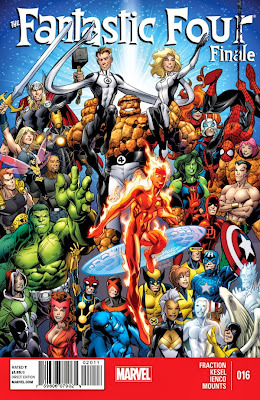 The Cup of Joe Panel stated both FF and Fantastic Four would end in January, just 16 issues after their original Marvel NOW! debut #1's. Marked by The Fantastic Four Finale, a special issue commemorating the end of editor Tom Brevoort's 141 issue run on the franchise. Then IGN ran an article now since removed, saying writer James Robinson and Leonard Kirk would relaunch Fantastic Four #1 next spring, starting with the demise of the quartet and working backwards from there as to how it happened. Maybe the IGN staff jumped the gun and official word will come tomorrow. Speaking of timing, Silver Surfer explodes into a new ongoing series in March, fuelled by the buzz around Marvel Cosmic. Snatching artist Mike Allred and writer Dan Slott along for the ride, Norrin will discover the universe in a new way, joined by a kindred spirit from earth. Iron Patriot #1 will serve as a platform for former War Machine/Iron Man James Rhodes to stamp his individuality all over evil. Also starting in March from writer Ales Kot and artist Garry Brown, James turns his back on Secret Avenger-ing to mark the home front. More than a demonic Fast and The Furious, All-New Ghost Rider revs up in March, launching a new #1 for a Spirit of Vengeance more interested in muscle cars than motorcycles. By indie creators Felipe Smith and Tradd Moore, the new series according to Newsarama stars Roberto Reyes, a mechanic in a bad neighbourhood, working to move he and his disabled brother to better places, when he falls afoul of underworld power-player, Mr. Hyde. Finally, Neil Gaiman announced Marvel will reprint the Miracleman material, including Gaiman's unpublished 'end' #25, starting this January. Neil also teased that he could "keep going" with the series. MORE MARVEL NEWS IN BRIEF: Deadpool: The Gauntlet will be a new digital only series, designed for mobile devices. Starting December 2014, it will be written by Gerry Duggan and illustrated by Reilly Brown. 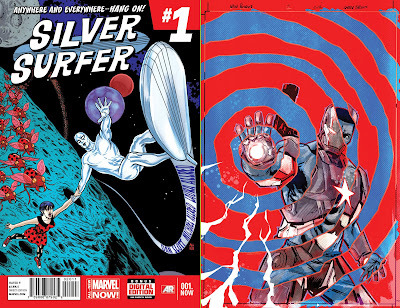 That cover logo for the Silver Surfer comic looks rather childish - it needs a sleeker look. Regarding my beloved FF - we at our FF forum were pleading for Karl Kesel to take over the writing chores, but having said this Robinson is a decent second choice for us. Just glad Bagley is off the book with his ugly art. This new number 1...I think what Marvel is doing now is having continual finite series, every twelve issues they stop a comic and start over again with a new number 1, theyr doing this with Secret Avengers aernt they. Personally, I stopped buying Fantastic Four with the last reboot. The plot didn't sound right for me, and that was hard - I've brought that title creative team regardless since the 80's, so Robinson's return has me looking at getting my familiar pair of PJ's back on again. I think relaunching is what cover gimmicks were in the 90's. Both a fad and something that seems to happen every #25 issues. All New X-Factor is fine to relaunch as is All New Ghost Rider for it is a completely new character, but the only thing changing in Secret Avengers it seems is the addition of Spi to the roster, unless M.O.D.O.K. turns hero too and joins them, you have to wonder if a relaunch on that basis isn't overkill? When I heard about the Gaiman/Miracleman thing I almost hyperventilated. That's been on the wishlist of anyone who wants to read all of his stuff, but has been frustrated trying to piece it together. I think Miracleman has one of comics most jawdropping, unexpected yet unsung pivotal scenes, the shower. It ranks right up their with Wolverine dying in Days of Future Past and Ozymandias revealing his twist in Watchmen to me. When Gaiman teased he could carry on with the series, I was instantly like a variation on Yoda. There is no could. Even if Marvel only had three cents to their name, if Neil says he could on go, you get him on-going. Exactly! I know fans of his Sandman series that hardly ever picked up a book before he wrote them, and then it started going backwards. I'd make (at knife point) people read Good Omens and American Gods. Then I'd wave Sandman under their noses. People who hadn't read comics since they were teeny had to follow. He's a cross spectrum writer whose name is now known by comic lovers and book nerds alike. And he can write in both mediums. No translation needed. I really wish they'd quit this starting, re-starting business. it is a fad, no better than the 90's as you just mentioned. If you're gonna do it, be up front with the paying readers and just divide the issues up into seasons like a tv show. Just do it, since it's already heading that way and has been for awhile now. Love Mike Allred art, and his Surfer looks pretty damn good to me. 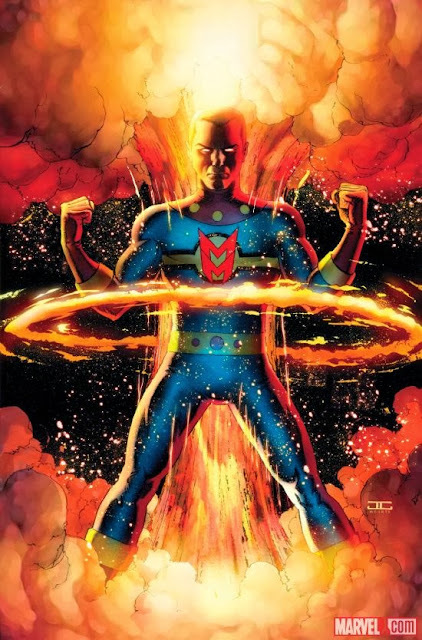 So Miracleman's back for good this time? I'll believe it when it happens. At least Robinson's finallyy getting a chance to publish the remainder of his run though. Iron Patriot huh? We'll see how well it works and how soon Rhodes will be back to as the militant War Machine. Speaking of seasons Dale wasn't that what the DC52was going to do, quit and launch new books every six months like they started doing? I think it was James more than Tony that addicted me to collecting Iron Man all the years that I did, so I'm definitely keen for his new book to succeed. Though War Machine is a hell of a better name than Iron Patriot, which does sound like a quarter pounder with extra cheese. I mean would you be a hero by adopting the name Norman Osborn used to dupe the world?